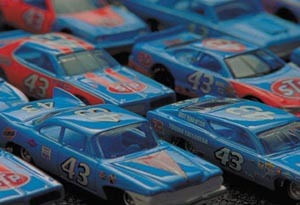 To promote the only NASCAR radio controlled die cast replicas at 1:64 scale, Racing Champions wanted to appeal to kids without alienating their adult market. "Move Your Collection" is a fast-cutting montage that simulates an actual NASCAR race cutting between two miniature replicas racing in a kitchen and the car's POV to a techno track. 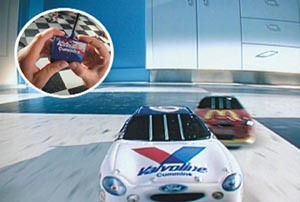 The POV was achieved by rigging an ice-cube camera to the "matchbox"-size cars to achieve the live, NASCAR feel. Also for Racing Champions, "With A Little Time" chronicles the Richard Petty 50th Anniversary Collection of 1:64 scale die cast replicas dynamically combining nostalgia match-framed to product and cut to a country/rock track.  Title effects were shot with a strobe and blurred for added intensity.